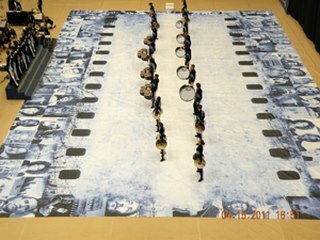 We are the official digital printer of custom floor tarps for the WGI World Championships. Our floor tarps and props are digitally printed with 4-color inks on high-quality vinyl that is heat seamed, lays flat and protects the gymnasium floor for years. 7-22 ounce vinyls are available. We also have blank floor tarps. "Whether I am faced with a strict deadline (which is more often than not) or just placing an order Kramer Graphics is always there to help me accomplished my task no matter how big or small the job is. For the best quality, customer service and turn-around time Kramer Graphics has more than met the standards we require in a printing company. Their staff is always friendly and is always on top off making sure I am keeping up with the proof approvals they send over to ensure I met my deadlines…it’s the little things such as that that go a long way in a family business."